Hello friends! Have you ever fantasized about zipping through the L.A. streets at speeds topping 100mph in broad daylight? We certainly do, especially when we’re stuck in L.A.’s famous traffic rather than at home playing video games on our awesome Playstation 3s. 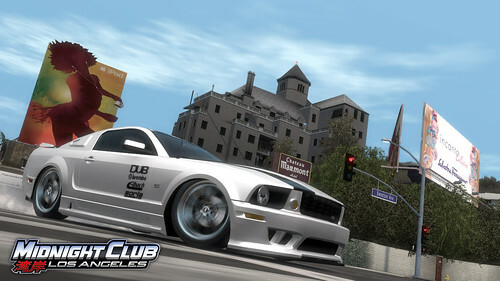 Well, come September, Rockstar Games will make all our dreams come true when they release the fourth video game in the Midnight Club series, Midnight Club: Los Angeles! Check out the trailer and more screen shots here! We’re hoping the recreation is so accurate that we can try out new shortcuts to the Arclight and then test them out five minutes before the movie starts! There had better be a DeLorean in the game. Especially after the 88mph reference! I confess, this makes me drool a little. I’m not a gamer at all, but I do own a steering wheel/gas pedal set for the desktop. I can’t pass up a good driving game. I’d love it if the game had a “Realistic Traffic” mode as well, just so I could try getting somewhere fast without the worry of higher insurance rates. Ooh LA based? Me likey. I’m sick of driving Tokyo and San Francisco, nevermind the ends loops of boredom of Gran Turismo. I seriously hope that Sunset between Beverly Glen and Whittier is there. The East-West is fantastic. No matter the car–Jetta, Scirocco or MINI–it was a fun ride. The only thing I missed about my job in Westwood was driving that strip home. Me again…I think I wet my pants…I just saw the screenshots. We are so getting this game. I really hope they include some of the hills of the Eastside, unlike True Crime. That would be freaking sweet. Did anyone see this screenshot? Is that really a Datsun? AWESOME!!! This is shaping up to be a great game, fortunately we don’t have PS3 and the Xbox has been shelved again until school is out. My boys become intolerable assholes when the videogames are out. Too intense and once the adrenaline is running they have a hard time controlling themselves. They may get it back in June after school is out if the grades are there. Anyone know the motorcycle choices? This looks great, but I agree with Will (Liam) that there needs to be a “realistic traffic” option. If the PS3 can’t handle that, maybe the PS4 will be up to the challenge. How fun would it be to get on the 101 and pass all the traffic in the emergency lane without any repercussions? Or make a U-turn and get off the on-ramp? Maybe each game could also come with a cell phone accessory, so that we can text message and download ringtones while we’re driving with reckless abandon. Anyone know the bike choices? I hit 50 mph once coming down the valley side of Beverly Glen once. 47 coming down the 4th Street free ride over the 110 into downtown. Will that is some pretty good speed on a bike. Did you see the episode on Topgear where the guy strapped on rollerblades with a jet back then raced a porsche? He hit 120…that is righteous speed on little wheels. Imagine that added to this game. Previous PostPrevious Get Rid of Your Old Rusty Paint Cans!